One of the great joys of growth in my personal life of recent stems from the question of how we ought to read our Bibles; learning to read the Bible as a story, a complete story, and that it should always be read as such. When the author of this book presented his title as “God is Near,” my first inclination was to wonder what passage he would pluck from the complete story to build his case for his book. I was pleasantly surprised to find however that there was no plucking going on with this book, but instead, a full asserting presentation of the complete story. Mr. Bunch begins at the beginning and carries the reader through God’s completed story finding its fulfillment where necessary; in Christ Jesus. God has always been near, but is ever drawing nearer with the gracious desire to dwell in the hearts of His people. I was so impressed with this book and the author’s approach that I purchased a couple of copies to place into the hands of co-workers I am trying to share my faith with (I hope to share a follow-up on this in the future). I recommend it highly as a tool for instructing, possibly even shared in small group settings. Still, it is a read with personal value for me also. I could not help but continually hear the words of a once often sang song, “I love to tell the story,” as I read through Clark’s generous gift he has given us. His is a meaningful offering, retelling the Greatest Story with his own flavoring and spices, a Gospel saturated walk with God from a garden and once again to a garden. This is the type of writing we need in this day when we’ve become enamored by the fruitless random flipping through Scripture that ignores the beauty of a completed story finding everything in Jesus Christ. 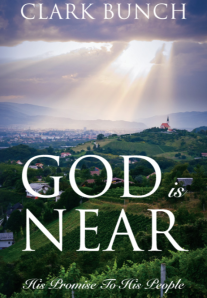 Clark Bunch is the long-time author at The Master’s Table, and you can learn more of his book at Outskirts Press, and, as it has mine, God is Near can find its rightful place in your Kindle library. This entry was posted in Books and tagged Christianity, inspiration, Jesus Christ, Religion and Spirituality, Story of the Bible. Bookmark the permalink. Thank you for the review and for adding your comments at Amazon.com. These are simply the most positive comments yet!